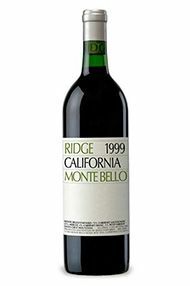 An excellent vintage throughout California producing a fitting finale to a remarkable decade for Californian wine. The effects of El Niño created a long, cool growing season - spring was very cold, while the summer was exceptionally mild. There was a week of intense heat at the end of September and this led to a rapid rise in sugar levels. Harvesting began in October and many wineries, such as Ridge, were harvesting into November. Quantities are down on the 1998s vintage but the quality is a notable step up. The Sauvignon Blancs and Chardonnays are ripe and well balanced with the Carneros Chardonnays being particularly successful. The Pinot Noirs ripened late, but successfully, but the year will be best remembered for its Cabernet Sauvignons and Zinfandels. The best are deeply coloured and display very good depth of fruit and are proving very age-worthy. The 1999 Cabernet Sauvignons are comparable to 1995 and 1997 in quality and style. A brilliantly focussed, classical Cabernet blend, approaching the moment when the fruit will blossom into the multi-layered complexity of a great Monte Bello. Decant well in advance of serving. "A wine of great balance, finesse and grace. Well-focused, the ripe, tart, rich blackberry and currant fruit is intense yet elegant, picking up earthy, mineral and sage notes, and finishing with fine, well-integrated tannins. Cab. Sauvignon, Merlot, Cab. Franc and Petit Verdot. Drink now through 2012."